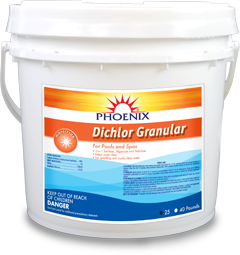 Phoenix Dichloro Granular - Phoenix Products Co.Phoenix Products Co.
(56% Available Chlorine) Dissolve this product in a clean plastic bucket stirring with a clean plastic spoon. Add this product to water, NEVER add water to this product. Maintenance Dose: Add 4 ounces per 10,000 gallons as an initial treatment. Repeat until a residual of 1-3 ppm chlorine is established. For superchlorination, use 1 pound per 10,000 gallons. To prevent damage to pool surface, use a pool brush to disperse any granules that have settled to the bottom of your pool. Keep filter system running for at least 12 hours after treatment. Frequency of treatment is dependent on ambient temperatures, light intensity, and bather load. Do not reenter pool until chlorine level has dropped to 3.0 ppm or lower. Available in 1lb, 2LB, 5LB, 10LB, 25LB Pail, 40LB Pail. Copyright © 2015 Phoenix Products Co.